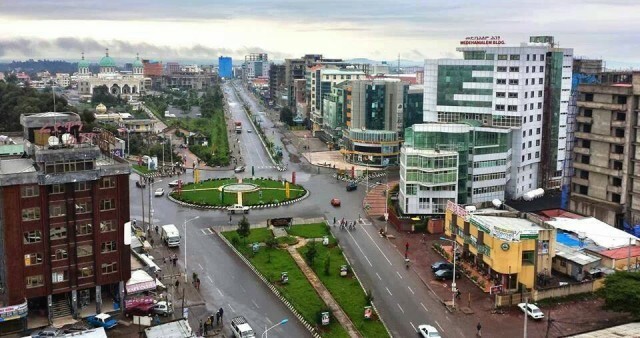 Addis Ababa, the capital and largest city in ETHIOPIA, is located on a high plateau in the center of the country. As home to the ORGANIZATION OF AFRICAN UNITY, an organization devoted to the interests of African states, Addis Ababa is also the diplomatic capital of Africa. Addis Ababa was founded in 1886 by Empress Taitu, the wife of Ethiopian emperor MENILEK II. An area of the city called Arada, which contained the palace, St. George’s Cathedral, and the central market, became the center of Addis Ababa. The city grew as noblemen who received land grants from the emperor established military encampments around the center. By 1892 Addis Ababa was the capital of the Ethiopian empire. However, a lack of firewood resulting from deforestation in the area led Menilek to consider moving his capital to another location. The importation of fast-growing wattle (acacia) trees solved the problem. A rail line joining Addis Ababa to the Red Sea port of DJIBOUTI was completed in 1917 and helped boost the prosperity of the city. Population also grew at that time, partly because of slave raiding in southwestern Ethiopia. Many of the people who were captured—and they numbered in the many tens of thousands—were sent to Addis Ababa. Ethiopia was under Italian control between 1935 and 1941, and the Italians planned to rebuild Addis Ababa according to a European model. They made changes that shaped much of the modern city, including the construction of roads and factories in the city. Arada, renamed Piazza, became the central market and commercial district. Today, Ethiopia’s main roads, rail network, and air routes run through Addis Ababa. With a population of about 2.5 million, the city is also the country’s financial, commercial, educational, and media center.